The Acousticbuoy DAC 2488 V.3 marks the most ambitious and most expensive DAC to enter my listening room. It arrived fast on the heels of the company’s Scorpio tube preamplifier. The Scorpio had demonstrated remarkable transparency and dynamic fervor. My expectations based on that product’s performance and the growing reputation of the DAC ran high. Would the designers manage to uphold the elevated performance level? And in a world of stiff competition, just how far could their design push the digital medium? Would it be a contender? A lot was riding on the shoulders of this product so let’s take a quick look at our feisty young company. Acousticbuoy has aimed high since its 2004 debut. They have avoided a larger product line over a multitude of price points to concentrate instead on just two distinct pieces centered on the mid high-end of current price conventions - a tube preamplifier and a transistor DAC. Their philosophy is one of keeping a design as simple as possible and allowing it to benefit from premium components and a top enclosure so the circuit works optimally. The Toronto-based firm combines worldwide parts sourcing and Hong Kong-based initial assembly with final product assembly and testing in Toronto. Their devotion to purist design objectives has led to products which are unique and extremely specific in what they attempt to achieve. 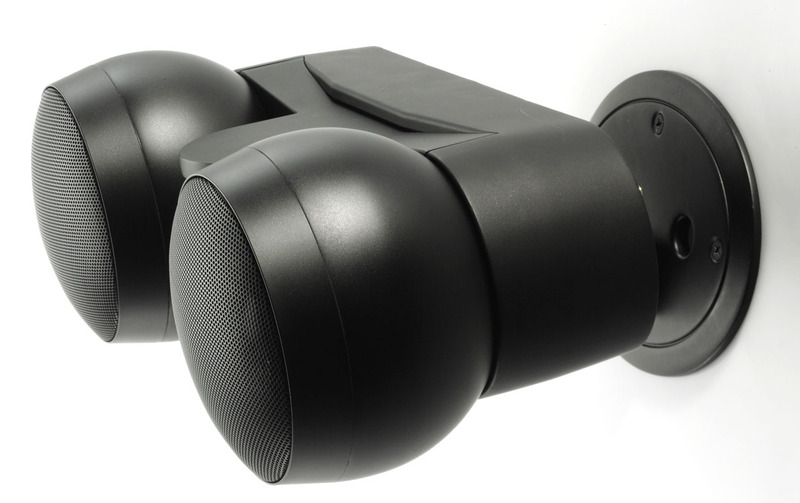 Acousticbuoy has pursued its proven design philosophy of minimalism and careful execution with the 2488 DAC. The current version 3 of this solid-state DAC improves on the already excellent performance of the V2 with even lower distortion figures and higher S/N ratio. The company is conservative with its published specifications and low THD numbers are actually worst-case scenario. Real operational figures are substantially better. The designers have recognized the continued dominance of CD as the digital playback medium of choice, reasoning that while SACD and DVD Audio may be superior, they have also failed to attract a wide audience. Therefore their DAC is intended to extract the best quality of performance from the more popular Redbook standard. The input accepts signals from 16 to 24 bits and sample rates from 44.1kHz to192kHz. The unit upsamples to either 24/352.8 or 24/384 depending on the original signal. At the front end lies a Wolfson Microelectronics WM8805 S/PDIF transceiver. Those with compressed audio files should be aware that the minimum input of 16/44.1 dictated by the design precludes the use of lower resolution MP3 files and indicates that this device is aimed at higher resolution sources. As a result, input is limited to a S/PDIF 75-ohm RCA and balanced 110-ohm XLR (AT&T optional). Those with substantial CD collections or higher-resolution download material will applaud these choices. Those hoping for a wider range of input flexibility may be disappointed. The Wolfson input is followed by a Latice DSP and an Analog Devices AD1852 D/A. As with the preamplifier, the case is built like a fortress. It is a hermetically sealed aluminum chest comprised of 6mm thick plates on top, bottom and sides and an 8mm front panel to eliminate RF interference and minimize internal digital interference. The chassis assembly is non-magnetic as are the alloy screws. Allen screws are used on the top and bottom plates. 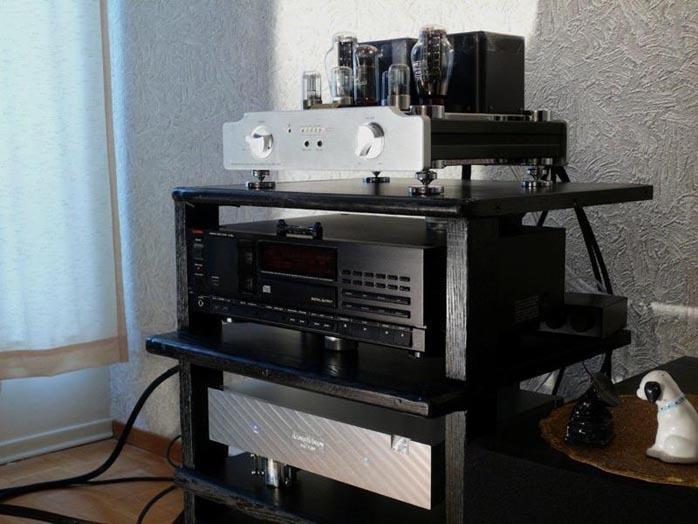 The three as opposed to four feet are consistent with the Scorpio preamplifier and in combination with the solidity of the chassis are used to combat microphonics. Components are hand selected, matched instrument grade and 98% have copper lead outs. Op amps have very low distortion. There are separate 4-layer circuit boards for the analog and digital sections and separate analog and digital transformers which are separated from one another to reduce EMI and isolated from the rest of the circuit by a thick aluminum divider. Acousticbuoy’s designers run an active jitter reduction receiver (a 1:1 digital interface transceiver) prior to feeding their DAC and a temperature compensated crystal oscillator master clock. This arrives at a specified jitter figure of <50ps RMS. Acousticbuoy's distributor hand-delivered the DAC 2488 in a labeled white product box. Regular customers would see the standard double boxed container. Protection was provided by 1-inch ply foam. A manual was supplied but no power cord. Purchasers are expected to provide their own quality aftermarket cable. As delivered, inputs and outputs were RCA and XLR. There’s a mains rocker on the rear and a toggle to select between XLR and RCA inputs. Case construction is identical to the Scorpio preamplifier. Panels interlock into the four corner posts in an intricate arrangement with top and bottom plates fastened via Allen screws. The face plate is finely textured to change appearance according to lighting conditions. 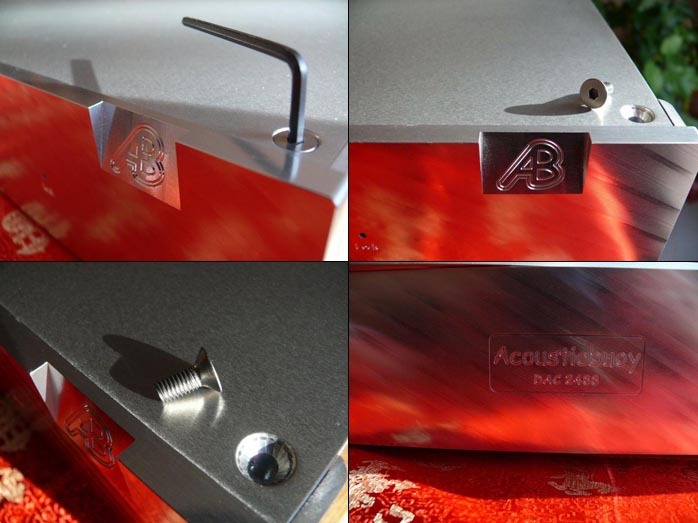 The Acousticbuoy name and large AB logo are carved into the front panel as are power and lock status indicators. There are two blue LEDs, one for power, one for signal lock. Rear panel information is likewise engraved. 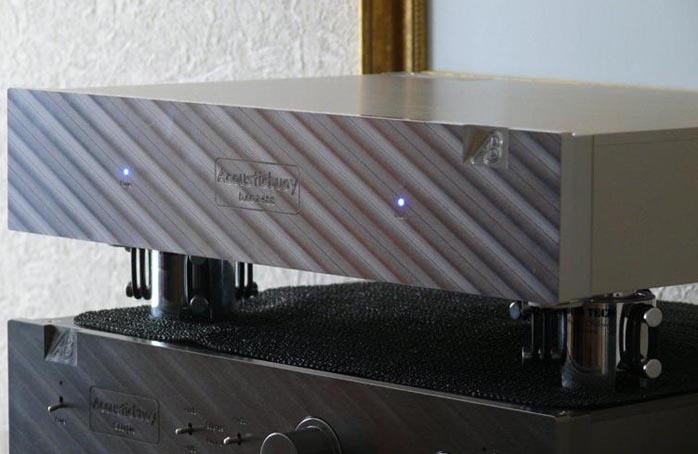 The solid and understated aesthetic mirrors that of the company’s preamplifier. The companion Scorpio preamplifier was on hand to afford me the luxury of testing the abilities of the DAC into both the Acousticbuoy and Audio Space Reference 2S preamplifiers. Comparative testing was done against the output of the zero sampling Michael Thompson-modified Luxman Brid CD player and later against the 24/96 DAC of the Audio Space CD player which offers both tube and transistor outputs for a fair sampling of different design philosophies. Due to incompatibility of source vs. input connections, I was unable to test my few high-resolution downloads so evaluation was confined to 16/44 source material. The subwoofer was included in the listening sessions to evaluate low bass extension and character. A Signal Cable Silver Resolution Reference Digital Interconnect ran between the CD player and DAC. I lined up some CDs and let the audio games begin. "Nobody Knows the Trouble I’ve Seen" from Antiphone Blues [Arne Domnerus/Gustaf Sjokvist Proprius PRCD7744] is an old chestnut but still highly revealing. The saxophone has palpable dimensionality and the hall acoustic is thick. "She’s Leaving Home" from Sound Impression Sampler Van den Hul Recordings [VDH99CR05] benefits from the Van den Hul recording technique for an interesting combination of a relatively dark acoustic with large artificial soundstage effects. "Devil May Care" from Live in Paris [Diana Krall Verve 4400652522] is a playful bouncy live version with well-recorded female vocals, fast changes and good separation of instrument lines - especially the electric guitar. The performance is enhanced by a more extended jazz interpretation. "Galicia Flamenca" from Flamenco Passion [Gino D’Auri FIM XRCD 023] is an intimate warm performance with a wealth of fine detail and rich acoustic remastered in fine fashion by Winston Ma. "Viola Forma de Moda" from Chesky Records/Jazz sampler Vol 1 [Chesky JD37] is a minimalist recording which challenges a system’s high frequency neutrality and resolution. Fast transients and slow decay. "Allegro maestoso - Violin Concerto in D Major, op. 3 N°.1" from Le Mozart Noir: Music of Joseph Bologne Chevalier de Saint-George [CBC records SMCD 5225]. Music from the King of Pop, not Michael Jackson. In 1774, this was the French answer to Mozart, gifted black violinist, director and composer Joseph Boulogne, Chevalier de Saint George. This recording captures some of that virtuoso fire with the talents of the renowned Tafelmusik Orchestra. "Les toreadors" and "Aragonaise" from Bizet’s Carmen Suite Symphony No.1 [Lopez-Cobos/Cincinnati Symphony Orchestra Telarc CD-80224] is a remarkably warm recording from Telarc with their traditional virtues of wide dynamics and good instrument placement. "Primitive" from Diva [Annie Lennox BMG 06192-1062-2] has Annie Lennox take a different set of directions from her Eurythmics background. Layered production with Middle Eastern undertones and a large artificial soundscape with good deep bass and performance subtlety. While the transports used were not of the "built like a tank" variety the DAC might have preferred, they still were of respectable quality. The DAC 2488 locked fine to their incoming signals. Acousticbuoy made an interesting decision regarding oversampling. It is fully automatic and defaults to either 24/352.8 or 24/384. Unlike with competitors, there is no provision to select between alternate settings of none through 192. The choice was made for you and follows the company’s philosophy of concentrating their efforts along a single path to perfection rather than trying to accommodate multiple different directions. They believe in "simple is elegant". Here they’ve kept it simple. Would their solution prove elegant? In going through the listening notes on the DAC 2488, I found that many of my descriptions were virtually identical to the Scorpio preamplifier. 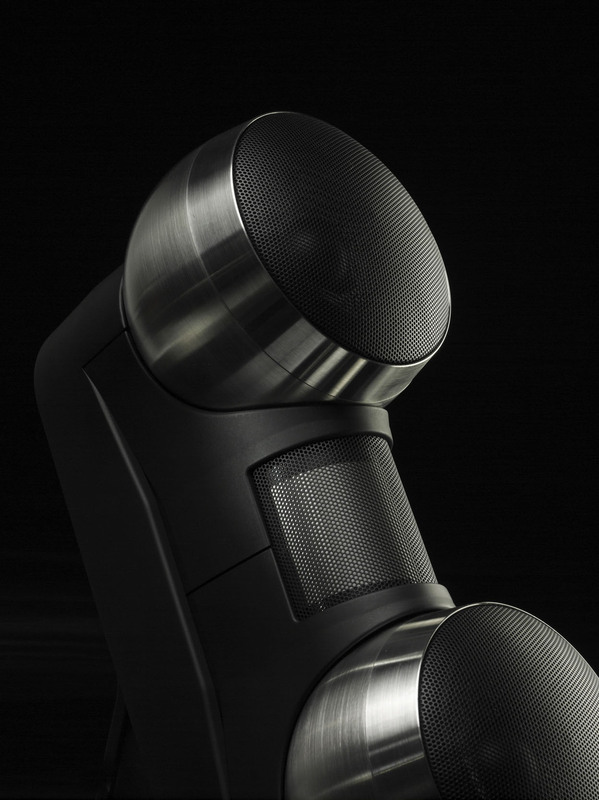 Acousticbuoy’s designs seem consistently aimed for low distortion regardless whether by tube or transistor. In their implementation, tubes have less coloration and solid state devices possess better tonal body and warmth. In the end their output devices from either side sound close to identical. The noise floor was very low. The unit was dead quiet with one odd exception. With the Audio Space CD player, there would occasionally be a short spurt of "digital noise" as the CD loaded and the two components achieved lock. This did not occur when the CDP was used with a different DAC and not at all with the Luxman. I looked upon the situation as an isolated interaction.